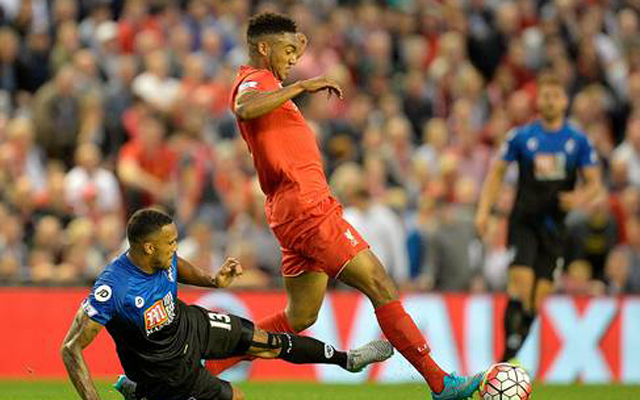 Liverpool boss Jurgen Klopp has described the moment that young defender Joe Gomez finally returned to full first-team training at Melwood. The centre-back, deployed at left-back during the early parts of his Anfield tenure, hasn’t featured under Klopp since the German took charge after picking up a horrendous injury right after Klopp’s appointment. He was expected to return in the summer ahead of this season, but re-injured himself and has been out now for over 12 months. Now though, the former Charlton man is back training with the hope of building up a base level fitness that will allow him actual game-time soon. As Gomez walked out onto Melwood’s training pitches, the rest of the squad greeted him with a round of applause. “With big applause he came back, it was really nice to have the boy back in training,” Klopp told the Echo. “It’s only parts of training and he needs time and he has to do a lot before he’s match fit. But it’s really good to have him back and actually it’s the first time I’ve had him (in training). Now it’ll up to the teenager to prove he should be considered alongside the likes of Joel Matip, Ragnar Klavan and Dejan Lovren in Klopp’s backline. At the moment, those three are battling for selection, with Mamadou Sakho still out of the picture, but in football things can change very quickly.